Who will carry her home? Who will capture her trust? 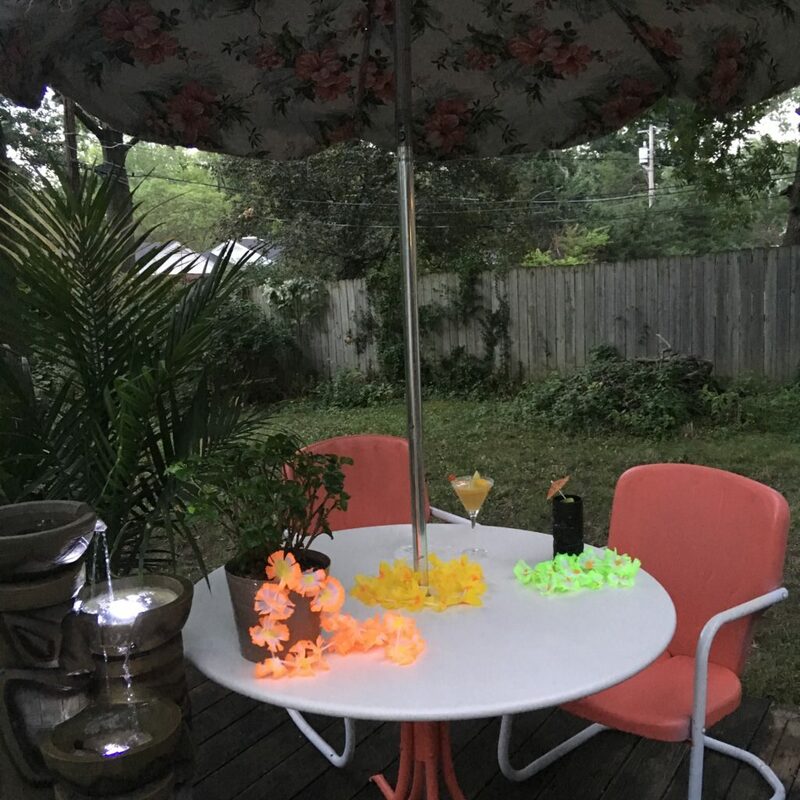 What’s so perfect about this metal chair, table, and umbrella combination—the entire image actually—is its utter imperfection. It is so crazy unauthentic! 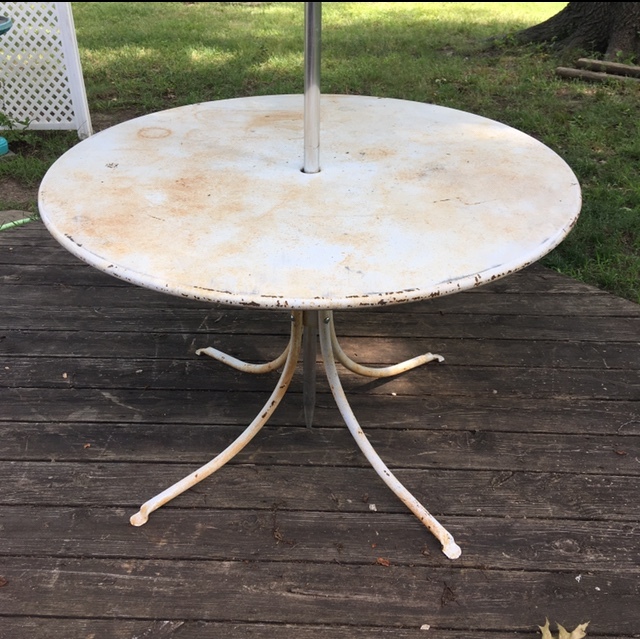 The table is pre-WWII and was originally all white as far as I can tell. 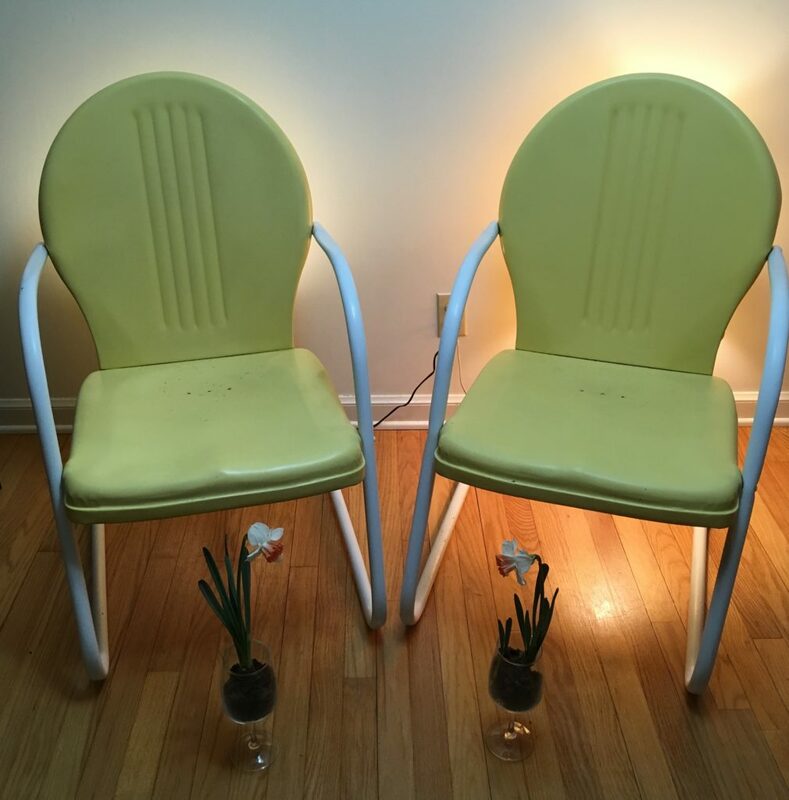 The chairs, probably made by two different companies (Flanders and Warmack), definitely after the war, both came out of the factory in a shade of green. I’d date the umbrella to around 1960, and a previous owner cut off all its glorious, dangling fringe. 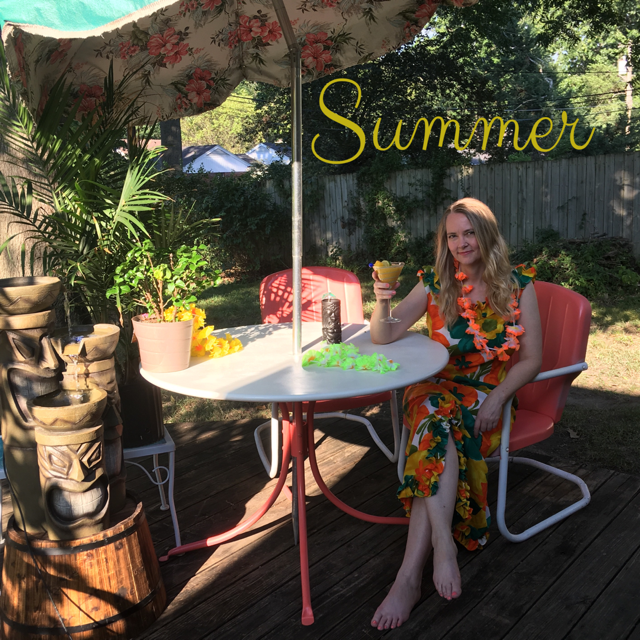 Yet, I cobbled these pieces together, cleaned, sanded, repainted, and created something that never was before, in hopes of creating the aesthetic of kitschy, mid-century Tiki. And the more I delve into my research of what Tiki was, the more I believe I’ve done exactly that. Ernest Gantt, who later renamed himself Donn Beach, sparked the mid-century Tiki craze during the depression. Donn collected items—flotsam, jetsam, nets, fish lamps, shells, etc.—in the late 1920s during his youthful travels to the Caribbean, the South Pacific, and beyond. After he ran out of money (his college fund to be precise), Donn returned to American and bootlegged for a bit. In 1933 he transplanted his accumulated treasures into a vacated tailor’s shop in Hollywood, establishing The Beachcomber Café, the birthplace of American Tiki. Interestingly, the soon-to-be hotspot for Hollywood elite (Chaplin, Crawford, Astaire, and Dietrich to name a few) contained not a single Tiki; California artists injected the namesake Polynesian idol into the movement years later. A post-WWII Flanders or Warmack. What Donn’s did have in the early days, and became most noted for, were his “Rhum Rhapsodies,”—secret-ingredient cocktails purely concocted in Donn’s imagination and his backroom bar. The beauty of Donn’s tropical escape, which was more raw and earthy than the other black-tie, paradise-themed nightclubs of the day, is the unification of beach “trash,” newly invented rum drinks, a casual atmosphere, and an ancient theme, essentially, a version of paradise created solely in one man’s mind. Arguably, he crafted an authentic, desirous ideal from the most inauthentic ingredients. But everyone was too busy having a good time to care. It’s said the American Tiki craze—the kitschy, alcohol infused, bamboo and palm, Hawaiian, orchestral tribal tune, mid-century escape—peeked around 1960 and died in the early ’70s. The coming-of-age baby boomers wanted their own scene. bedded deep in our DNA. The more humans evolve and progress the wider the inevitable gap from our instincts. We’ve created a complex world for the sake of complexity—to give our minds problems to solve because we’re no longer fighting to survive every minute of every day. And it’s exhausting. And stressful. And we need an escape from what was supposed to be paradise. But isn’t. Because the mortgage and the new transmission and the guy with no vocal filter in the cubical next door and the endless weekend soccer tournaments . . . these things are all overwhelming. Sometimes we want to push it all out-the-door and simply eat, drink, and mate. Do we need it? Yes. Does it sound savage? Of course. That is the promise of Tiki. Tiki objects in the image below. The artist, the table and chairs. A shout out to Don Storer at Midcenturymetalchairs.com for his ongoing research assistance. Cate, Martin. 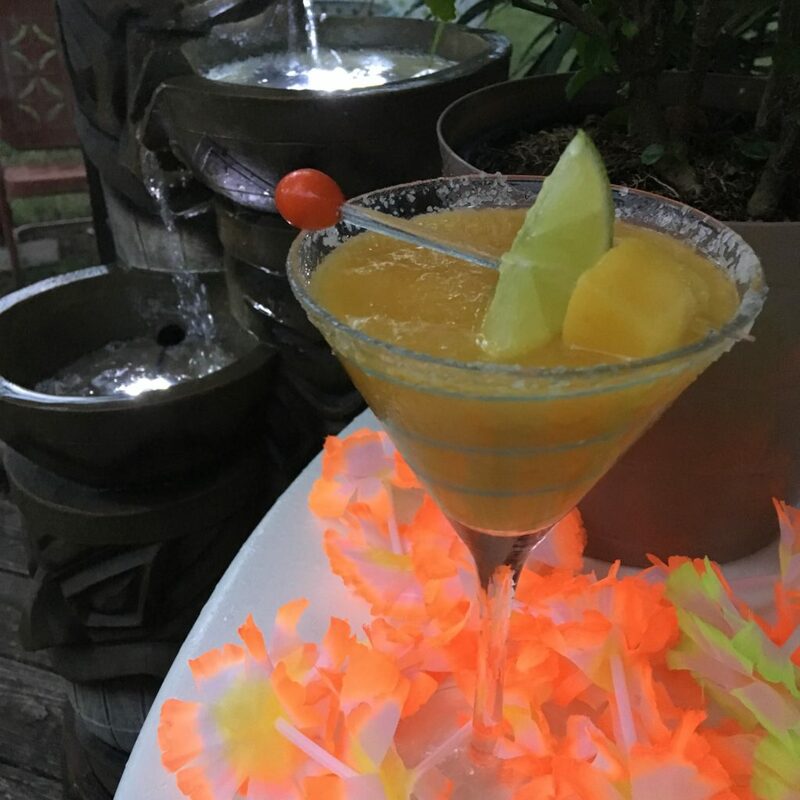 Smuggler’s Cove: Exotic Cocktails, Rum, and the Cult of Tiki. Ten Speed Press, Publisher. 2016. I’ve often pondered how to artistically recraft this chair, but no ideas or visions ever came to mind. The cracks in the final layer of cream paint along the verticle grooves of the seatback always intrigued me, as if they held importance. Beyond revealing what is probably the original, decades-old coating of deep, red paint, those cracks said, “Hold off on recreating. Wait for a revelation.” I waited a year and a half. 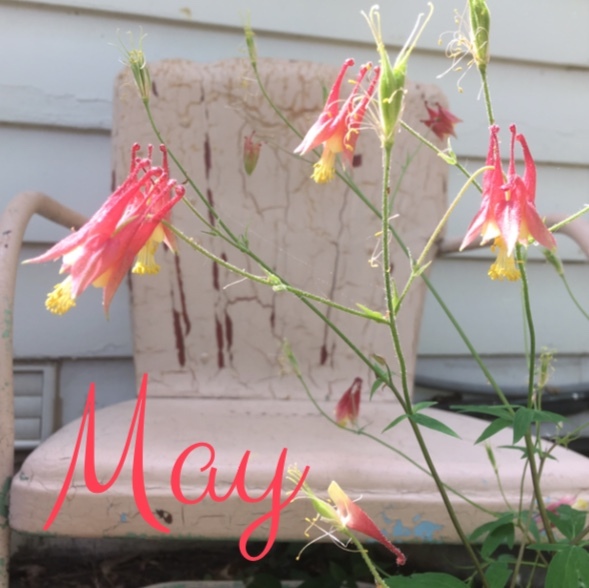 It wasn’t until the crimson columbine bloomed in my garden this spring that the inherent beauty of the chair blossomed in my head. The five, slender design grooves, hinting at the red majesty of the past, mirror the five, delicate, verticle petals of one of my favorite mid-spring flowers—the columbine. Period: 1938 until at least WWII. Uncertain when production ended. My bowling game has its ups and downs. The last time I visited my local alley, I did something incredible and unusual for me; I bowled two strikes in a row. This feat was followed up by a move not so unusual for me—a gutter ball. Not only is this occurrence over-the-top embarrassing, but when you factor in the intricacy regarding how to score the game, this fail yields the worst possible outcome. It’s a missed, one-time opportunity to add a significant amount of points backward. But it’s also a testament to the wide swings—the sharp peaks and valleys—for the occasional, just-in-it-for-kicks, “fun times with fam and friends” bowler like me. During the middle of the last century, the Brunswick Corporation, the leading manufacturer of bowling equipment, experienced those same peaks and valleys. In the 1950s—following the wave of post-war optimism—bowling centers sprung up everywhere. This expansion played off a strong economy, improved leisure time, suburbanization, and the introduction of the automatic pinsetter. Between 1955 and 1965, the number of bowling alleys nearly doubled, from 6,600 to 12,000. Considering they’d been producing bowling equipment for taverns since the 1880s, perhaps it was finally Brunswick’s time to shine. To rule. To firmly affix their crown on the leisure industry. This entertainment explosion neatly coincided with the mid-century modern design and architectural escalation. 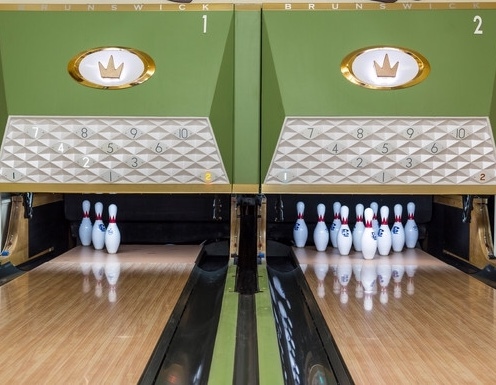 The Brunswick company had the keen business sense to marry these two trends, crafting bowling alleys with clean, streamlined, brightly colored plastic and metal seating, scoring tables, ball returns, and pin-setter facings. Their fortitude took the aesthetic one step further, styling the iconic Brunswick crown logo on their products with crisp angles and perfect symmetry, in shiny metallic and bright mid-century palettes. According to their 1960s advertising film, graduated shades of coral, gold, green, blue, white, and tangerine could be mixed in any combination to create a proper atmosphere for recreation. But—in complete correlation with my bowling game and the iconic Brunswick crown—subsequent to the steep inclining trend of bowling alleys popping up, there was a decline. After about ten years of rapid suburbanization, planners and investors had simply overbuilt. The market was saturated, and the urban bowling centers began to close because fewer people were there to bowl—folks had flocked to the suburbs. So, the number of open alleys actually began to shrink. Although Brunswick lanes will probably continue to be around for a long time, their heyday peak will forever be sharply planted in mid-century modern flavors, styles, and lines. When I first saw this Arvin metal lawn chair, its perforated back and seat formation resonated with me as crowns. I saw the chair as a princess. 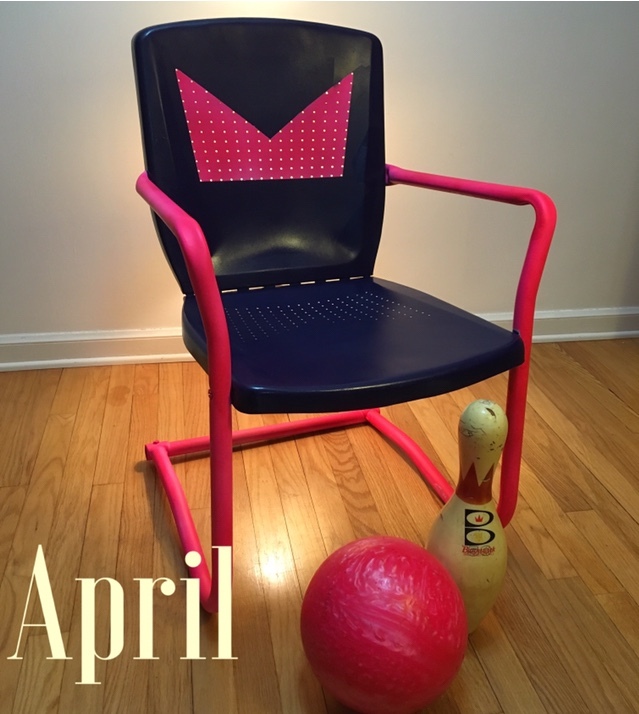 But as I applied bright, mid-century paint colors, it felt more like a bowling alley, the chair’s back “crown” so similar to the crisp, 1950’s and 60’s Brunswick crown. 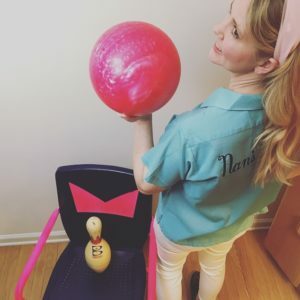 I was no longer going to a ball—I was taking my ball and hitting the lanes! 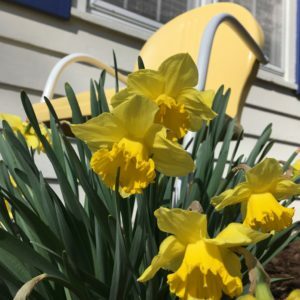 In classical mythology, Ovid tells the tale of Narcissus, the son of the river god Cephissus and the nymph Liriope. Narcissus was warned by his parents that he would live a long life only if he did not look at himself. Although many nymphs and women fell in love with him, he rejected them all. The mountain nymph Echo, who had been cursed by the goddess Juno to only repeat the last words she heard, was devastated by Narcissus’ rejection. She withdrew from life and faded away until she was no more than a literal echo. 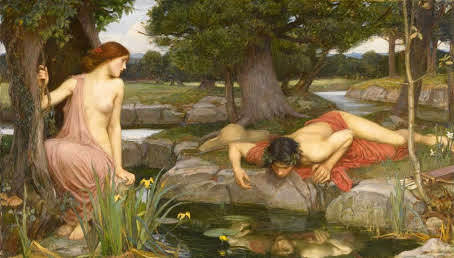 Nemesis (as an aspect of Aphrodite), the goddess of revenge, learned of this story and decided to punish Narcissus. She lured him to a pool where he saw his own reflection. Not realizing it was only an image, he fell in love with it, and when he determined that love could not be reciprocated, he committed suicide. A Narcissus flower grew on the spot where he died. 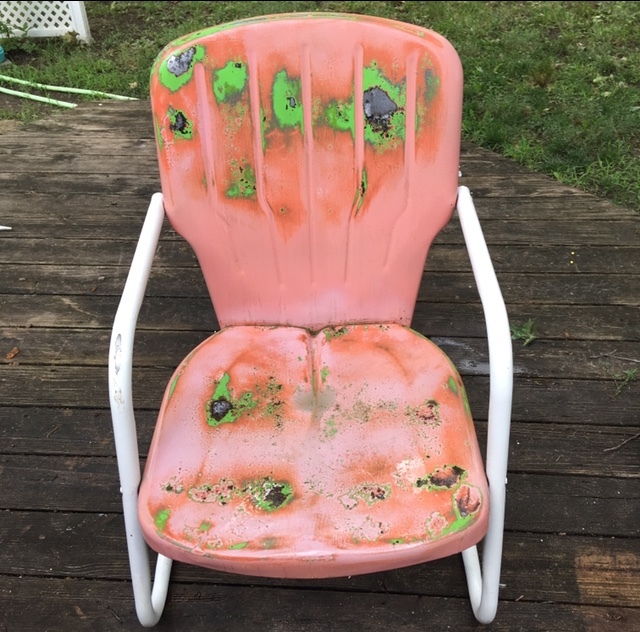 There’s a rumor floating around the metal lawn chair community that this chair was once called “Sweetheart Chair” in an advertisement. The evidence, however, is currently lost in the deep, dark, depths of the Internet. Or maybe in a yellowing magazine in the cobwebby archives of a library. But I like the name. 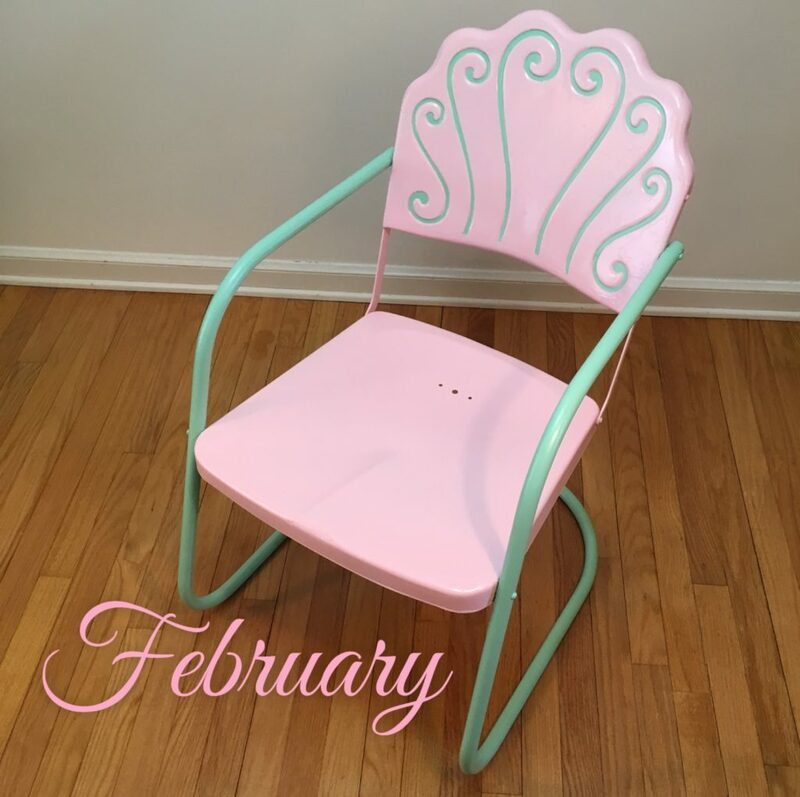 Not simply because it’s February—the month for sweethearts—or because this chair of mine is finished. And pink. No, it’s because this particular chair has a sweetheart. I found this metal lawn chair in a flea market, all alone. This market was the same place I found most of my chairs in the early days, and at reasonable prices. However, this chair was double the price of anything I’d ever seen there. Problem was, I was pretty green in those days and had never seen anything like it. Unique. Lovely. Feminine. She spoke to me. “Save, me,” she said. With all the makings of a damsel in distress, she sat outside in the chilly spring air, amongst the junk, next to a busy road, at the filthy flea market. So, I slayed the dragon (coughed up the cash), threw her over my steed (squeezed her into my Taurus), and carried her away to my castle (my quaint Cape Cod). That same day, in her rusty and weathered condition, I decided to show her off. There were many suggestions regarding how to redress her, interpretations of her authentic style, and a few admirers already asking for a spot on her dance card. Yes, a photograph friend wanted to buy her “as is” to be used as a prop. But this Eliza Doolittle was no prop… She was meant to be enjoyed and loved, not admired from afar. Yeah. 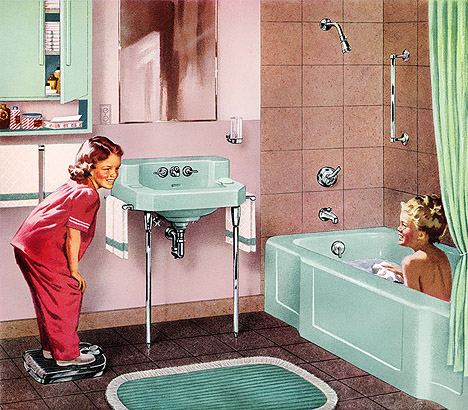 A 1940s/50s pink and “Ming Green” bathroom. 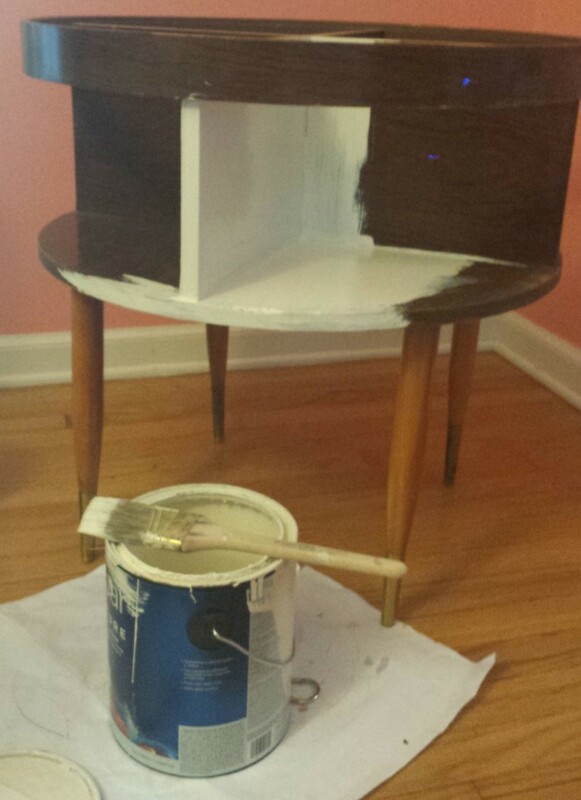 The passionate chore of sanding away rust and smoothing layers of paint filled my summer afternoons and evenings. But I spent my mornings commuting to my accounting job. On one of those mornings, I spied a potential companion for my Sweetheart Chair. He sat on a driveway next to the garage door, just off the busy street I traveled twice a day. 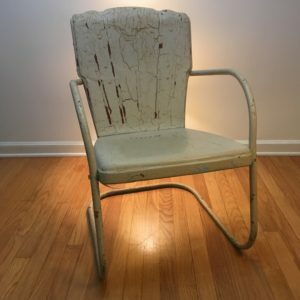 Surrounded by a handful of white, plastic chairs and decked in primer gray, this Sweetheart Chair didn’t fit his environment. Several times I considered stopping at the house, offering the owners up to $50 for the chair. But I was a little worried I’d make them angry—insult them somehow. And a little worried they’d think I was crazy—who does that sort of thing? So, I hesitated. Everyday the chair stared me down as I drove by, and everyday something about it just didn’t feel right. August rolled around, and I found myself in Wisconsin, Milwaukee to be specific. Just walking down the street… Literally! Out of nowhere, I bumped into him, perched outside a storefront, out of place and out of time. 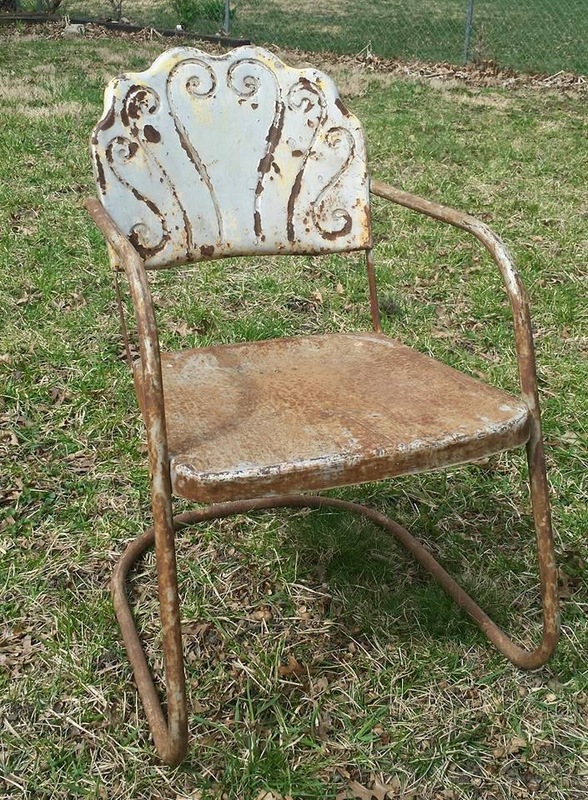 A little worn, a little bent-out-of-shape, the chair remained young for his age. Most important, this Sweetheart was without a mate. Did he have any idea a future beauty resided in Kansas, dreaming of a partner? 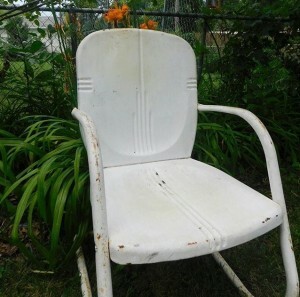 Maybe so, because he was priced to move—the least expensive metal lawn chair I’ve ever found. No dragon to slay this time, I tossed my coins on the counter, loaded him up, and proceeded to cart him across four state borders. They sat side-by-side on the back porch for awhile, only separated when I took her into the grass to continue prepping and painting her. But winter came. And she was too pretty to leave exposed to the elements. I brought her inside so she could hang with the other pristine chairs in the warm, dry basement. He remained on the porch, with the pedestrian and unfinished chairs. And I forgot they were apart, until today. But uniting the two requires one of them to change. I don’t know how this story will end. What does it feel like to yearn for your Sweetheart? I know the sadness well. It’s an old friend, who lingers on my porch, long into the night. 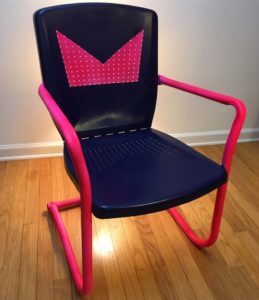 A shout out to Don Storer at Midcenturymetalchairs.com for his continued research assistance. The first Starburst Clock I acquired: an Elgin, most likely produced in America. Despite all those pesky, nitpicky facts, I find the overall theme of Welles’ speech to be spot on. I believe after times of destitution, turmoil, atrocity, and warfare, there is a rebirth, or even explosion, of art. And its mood—pessimistic, optimistic, or, God-forbid, neutral—is irrelevant, especially if said art is in the form of say…a Cuckoo Clock. Or, if you happen to be a mid-century modern nut and prefer your clocks to burst from the center without the aid of a startling, wooden birdie. 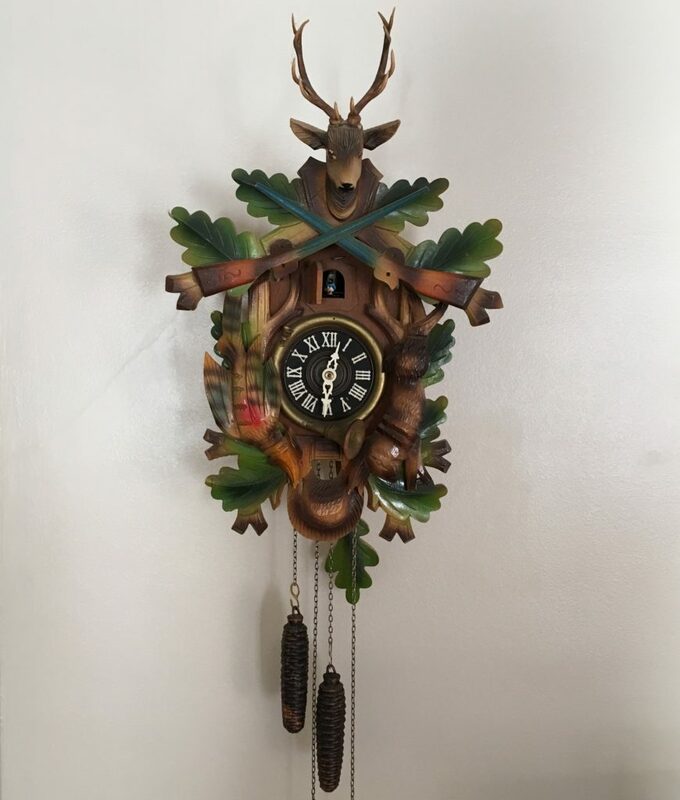 My grandmother’s mid-century Cuckoo Clock. A gift from my dad, straight from the Black Forest. In the mid-1960s, my dad guarded the Berlin wall while stationed in Germany with the U.S. Army. A time of peace in the United States, I can only imagine the ongoing turmoil in East Berlin as people continued the difficult and blockaded process of recovering from a destructive war and ongoing oppression. Despite the strife he witnessed on the other side of the wall, my father returned to Kansas with a handful of souvenirs from his ancestral homeland: a small collection of Cuckoo Clocks. One he kept for himself and his future family, one he gave to his mother, and, we believe, he passed on a couple to his sisters. I have the one he gave his mother, which hung on her living room wall for the remaining duration of her life—about forty years. Made in the mid-century and fashioned from wood, metal gears, cast iron pine cone weights, and a carved maple leave pendulum, this clock has, in effect, the exact same function as its stylistically modern cousins: to keep time. “And there was one night when the ball clock got developed, which was one of the really funny evenings. Noguchi came by, and Bucky Fuller came by. I’d been seeing a lot of Bucky those days, and here was Irving and here was I, and Noguchi, who can’t keep his hands off anything, you know—it is a marvelous, itchy thing he’s got—he saw we were working on clocks and he started making doodles. Then Bucky sort of brushed Isamu aside. He said, ‘This is a good way to do a clock,’ and he made some utterly absurd thing. Everybody was taking a crack at this, pushing each other aside and making scribbles. 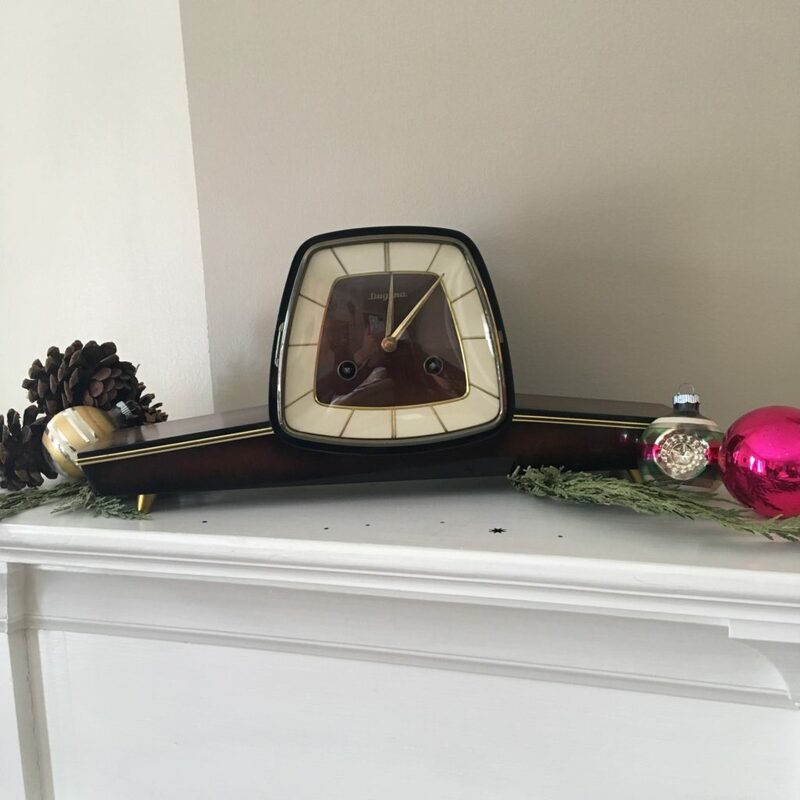 An original George Nelson Ball Clock. No one has gifted this to me yet (hint, hint…). Given Mr. Nelson’s story, it’s up for debate if their initial clock grew out of warfare or brotherly love (using Orson Wells’ terms). Launched in 1948, the Ball Clock picked up the name “Atomic” because it resembled the structure of an atom. Perhaps not a coincidence, its inception corresponded with the infancy the Atomic Era in design. 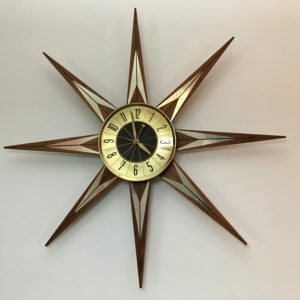 Evolution pushed the Ball Clock toward arguably the most iconic clock design of the modernism movement, the Sunburst, or Starburst Clock. Much more versatile in interpretation than the Ball Clock, this new design was conceived in 1949 by Nelson Associates for Howard Miller. However, this new concept literally burst into an array of materials, complexities, and compositions by designers and manufactures around the world. 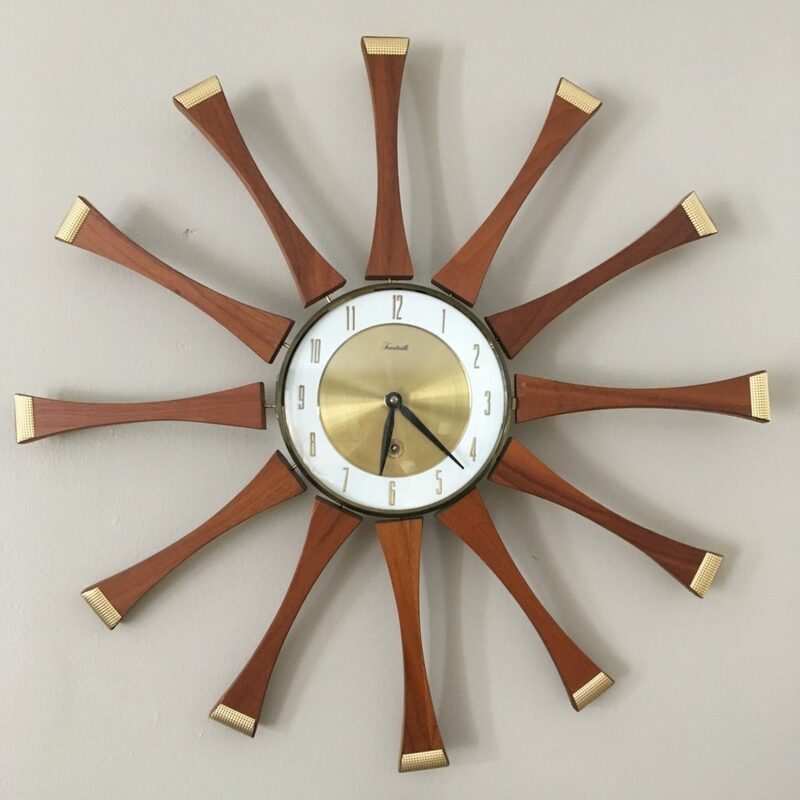 A mid-century Forestville, Starburst Clock. but now I’m having second thoughts. This last Thanksgiving, I picked up my second Starburst Clock. I was naïve enough to ask the check-out clerk at the antique mall if it worked, or if they had a battery we could test it with. He and I both examined how the movement was attached with itty-bitty screws to the back of the clock and gave in to the obvious hassle. I purchased as is, telling myself it could surely be repaired it necessary. The next day, after a bit of research, I realized it was a wind-up clock (so that’s what the funny looking hole on the face of the clock was for…). I didn’t have a winding key, and during my investigation the glass door covering the face came unhinged, so my next stop with the clock was the neighborhood jewelry shop. 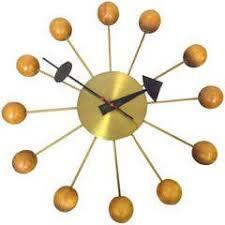 When I retrieved the clock a week later, my enthusiasm for mid-century modern design was perhaps a bit over-the-top. The clock guy saw an opportunity and asked me to follow him to the back of the shop. What sat on a dusty shelf in a dark hall by the back door caused me to gasp. After he’d satisfied himself that it kept near accurate time, I bought yet another mid-century clock, this one at a bargain price. A 1965 Dugena (Hermle) mantle clock. Modern with an Art Deco twist, this one I gifted to myself. George Nelson, a student of architecture and an accomplished designer and writer, lent himself to a modern-day Leonardo de Vinci. Howard Miller, who put his stamp of approval on every clock Nelson’s team designed, was trained in the art and science of clock making by his father, Herman Miller, in the German Black Forest. While crafting his profound dialog, was Wells actually considering his contemporaries—modern day artists and patrons whose legacies carried on into our current century? Historians may be satisfied with the Cuckoo Clock speech “holes” listed above, but artists, aficionados, and mid-century modern enthusiasts should demand an addendum. Although “every day” and functionally necessary in our modern world, a clock can’t be mocked for lacking significant artistic value. Considering that some of Nelson’s original clocks sold under the Miller brand are currently listed on online auction sites for thousands of dollars, it’s fair to say these objects are sought-out treasures. Designed in America after many years of depression and warfare, and approved and marketed by a Black Forest trained patron, the modern Ball and Starburst Clocks united post oppression artistry with the true home of the Cuckoo Clock. That’s a well-crafted, lucrative twist of “brotherly love” even the Swiss would envy. Reddit: Ask Historians. Web. 23 Jan 2018. “House of Borgia”. Wikipedia. N.p.,n.d. Web. 23 Jan 2018. “George Nelson (1908-1986), USA Biography and More”. N.p.,n.d. Web. 23 Jan 2018. Joiner, Ronald. “Dugena Mantel Clock Revisited”. Antique and Vintage Clock Collecting and Repair. Web. 23 Jan 2018. Oliver, Richard. “Franz Hermele Clock Company History”. Antique Clocks Guy. Web. 23 Jan 2018. 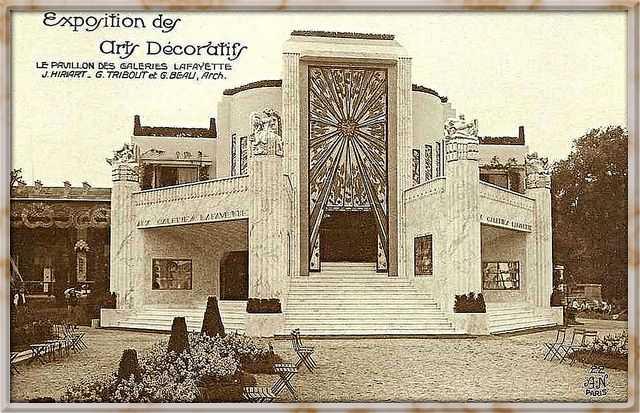 1925 Paris Exposition Internationale – Le Pavillon Des Galeries with a rich Art Deco facade. Parisian by birth, Art Deco burst onto the scene at the 1925 Exposition Internationale. He grew strong and tall, influenced by African culture, Picasso, and Bauhaus. Ridged, bold, fierce, angular…he soared to new heights, forged new industrial frontiers, and cast away the clutter of the past. Yet the architectural and design gods realized Art Deco needed a companion, so they stole an element from his being, softened it, rounded it…crafted it feminine. Streamline Moderne possessed the sophistication of Art Deco, and the intellect, but she danced with curves and seduced with movement. Long, slender lines. Aerodynamic grace. She was truly the face that launched a thousand ships. 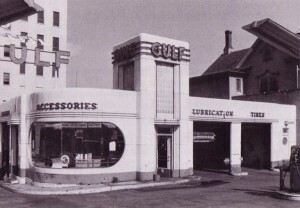 Gulf Filling Station in glorious Streamline Moderne. Their youthful days were long and industrious, their nights a jazzy, café society romp. But the tides turned, and they came-of-age in the harshest of realities. The two intertwined and clung tight during the depression and the war, abandoned by their gods, sudden slaves to efficiency, practicality, and necessity. When the dust settled and peace reigned, when breaths could sustain…linger…expand…they bore a love child, and cradled him in freedom and enthusiasm and American capitalism. 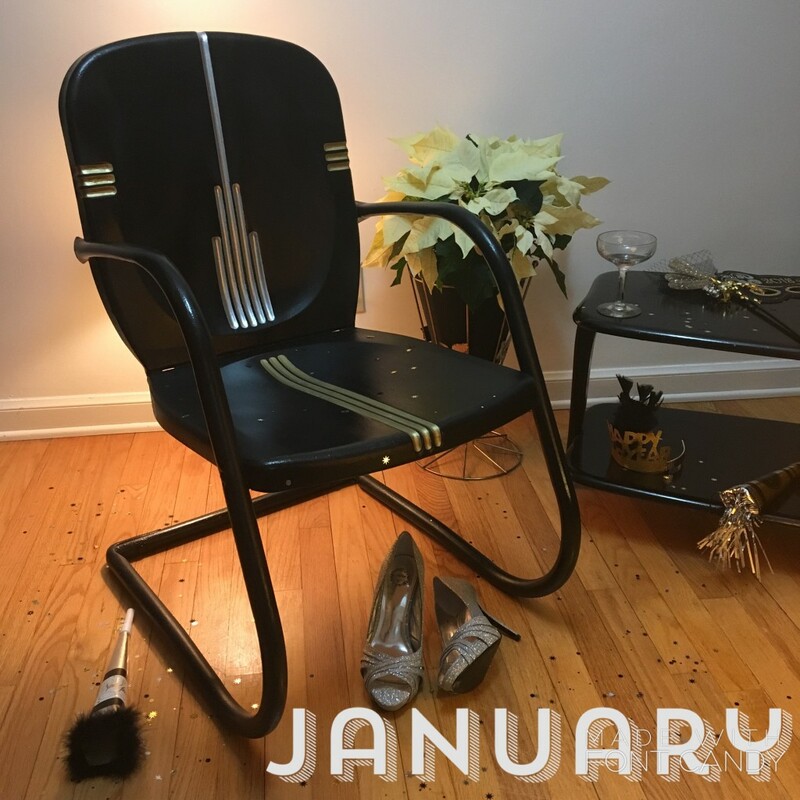 He grew to be clean-lined, futuristic, and all-kinds-of “matic.” He thrived in optimism, lit the night sky with starbursts, and took the name Mid-Century Modern. And the gods were pleased. When I found the chair. Dull, flat white paint and bits of rust. 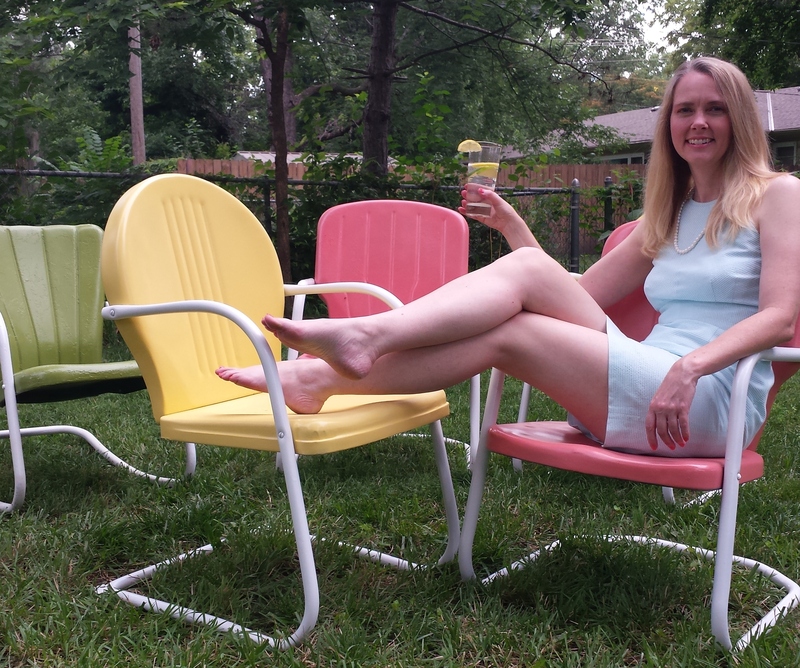 This metal lawn chair was made by the Arvin Furniture Company in the 1940s. When I acquired it, the chair had been repainted from its factory finish in a flat, dull white. But the groves in the metal—the long, arched, lean lines—spoke to me instantly. 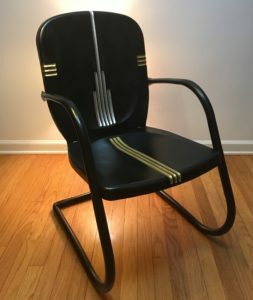 They said, “Art Deco.” They said, “Empire State Building.” Later, the subtle lines on the side announced themselves as “Streamline Moderne,” and I realized my Empire State Building chair was fluid, not only a testament of the greatness of its own era, but a foreshadowing of exciting things to come. Chandler, Arthur. “The Art Deco Expositon”. Web. N.p.,n.d. 7 Jan 2018. For the children who became known as the baby boomer generation… During civil defense drills, while you were curled up in a ball under your school desk, did you ever consider that Santa was watching? The fear in her eyes puts tears in mine. 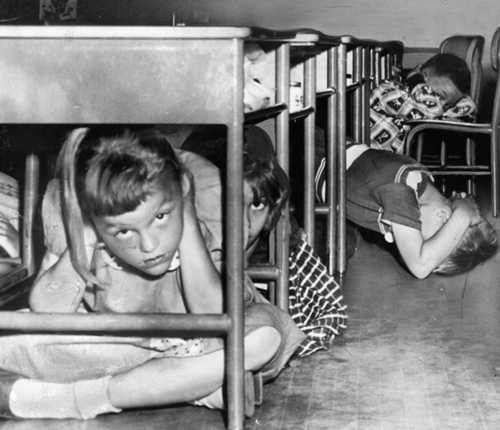 As a kid I was never once instructed on how to “duck and cover” under my school desk. I guess at that point in the Cold War, during the 1970s and 80s, America’s fears had thawed regarding a nuclear weapon being launched by Soviet Russia. Or more likely, educators and the Civil Defense Administration were in a new position, caught somewhere between the perceived ridiculousness of the practice and the political fashion of the day. Even as early as the late 1960s, America’s fears and fascinations with all things atomic had decayed. The mid-century lust for conquering space by progressing science, which went so far as to bring representations of starbursts, parabolas, and atomic symbols into our newly constructed, suburban tract homes, also fell out of fashion. This period of history, which began in 1945 with the detonation of the first nuclear bomb, became known as the Atomic Era. By 1965 its lure had peaked and was rapidly cooling. A few months ago I realized I needed a couple Christmas stockings at my 1953 Cape Cod home, and, of course, only mid-century stockings would do. I hoped there were still a few still hanging around from the 1950s that screamed “Atomic Era.” I scoured eBay and the Internet—surely the supreme coolness and innovation of the mid-century aluminum Christmas tree spilled over into other decorative traditions of a mid-century Christmas celebration. Apparently it hadn’t. I found nothing that satisfied my atomic craving. My enthusiasm briefly went cold, much like a hard lump of coal. Once again, I was forced to revert to what has become a perennial Plan B in my life: if you can’t find what you want, create it. 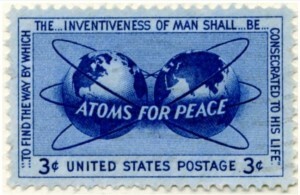 “Atoms for Peace” was the title of a speech delivered by President Dwight D. Eisenhower on December 8, 1953. He was addressing the UN General Assembly in New York City as part of the media campaign called “Operation Candor.” The idea, arguably propaganda, was to enlighten the American public on the risks and hopes of a nuclear future. At first glance, I was shocked by the idea that atomic fission should be consecrated. Eisenhower hoped to squelch national fears and reassure its citizens of a scientifically progressive yet militarily level-headed U.S. government. Atomic energy—the result of nuclear fission—was to be used for good, not evil. Convincing the Russians to do the same was an obvious diplomatic mission. Sustainability of the human race and any chance for lasting peace depended on it. Mid-century design for peace…The preoccupation and alarm of atomic energy and its manifestations drove the post war culture, but not only to build fallout shelters and practice air raid drills. In a mid-century paradox, the atomic symbol and its scientific cousins wove themselves aesthetically into the period’s design, often found in architecture, automobiles, and perhaps more abundantly, interior design. After splitting the atom and winning a world war, America’s confidence rode high, and we were enthusiastic to conquer space. We stamped that fervor into entertainment, children’s toys, and the basic elements of our lives—the simple yet essential components of our homes. Mathematic and scientific representations such as parabolas, starbursts, and amoebas were incorporated into the look and construction of interior design enhancing futuristic and progressive flare. The atomic symbol fit neatly into the evolving mid-century style, easily found in the form of wall clocks and light fixtures, and less obviously in the slender, arching, metal legs on tables and chairs. Those thin geometric lines, appropriately known as a “sensitive line,” gave furniture the appearance of gravity defiance. 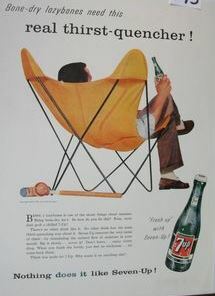 Seven-Up ad featuring the Butterfly chair. The sensitive lines (the chair’s metal legs) resemble the atomic symbol. According to Thomas Hine in Populuxe, the theme for the period was dynamism and fragmentation. The scientific, industrial, artistic, and economic systems exploded in post war America. As a result, people moved out from the city core and created their own small sanctuaries in the suburbs. Bringing symbols of the atom into these new homes—their isolated space for refuge and peace—seems a contradiction. To lounge in a chair with atomic shaped legs and glance at your atomic clock, while only mere feet from your bomb shelter—an arguable necessity due to fears of atomic weaponry—is a fascinating mid-century paradox. Santa for peace…A sleek, linear Santa Claus made a bold appearance in atomic era design. He jetted across Christmas cards in rockets and spacecraft, propelling American faith that we could get there, too. He carried his traditional optimism in the modern craft of his choice, and still toted an array of of presents, even though the American landscape for materialism had vastly changed. By the 1950s he was firmly established in American culture and acting as a convenient conduit for the exploding post war phenomena of consumerism. Could there ever be a better advertising spokesman for frivolous consumption than Santa? The era of economic boom, mass production, and constant upgrades for progress, used Santa as a well suited vehicle to promotion and push products out of the suburban retail stores and under the manufactured aluminum Christmas tree. Santa was all over the scene in mid-century America—appearing in pre-holiday parades, on Christmas cards, in newspaper advertising inserts, on mugs filled with hot chocolate, in seasonal yard art…not to mention in department stores, where Santa could cleverly ask an innocent child what he or she desired as a Christmas gift. How often was that object within proximity of Mommy and conveniently located near a cash register? 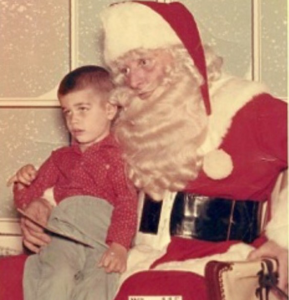 A three-year-old on Santa’s lap in a Virginia Department store, circa 1961. The child appears to be a bit fearful as to his status regarding The Naughty and Nice List. This cynical view of Santa is merely a portion of his complex and long career. His rich history includes fourteenth century accounts of teachers dressing as St. Nicholas on December 6th and using a birch rod to beat the children who failed academically that year, while rewarding successful children with sweets or pocket money. Santa’s mid-century career mirrors that of another 1950’s global power and icon, if you will. He’s acting much like Eisenhower, who hoped to advance industry, keep the peace, and promote responsibility. Santa, similarly, is balancing the desires to produce and distribute material goods with the need to keep people, mostly little people, accountable for their actions. Santa had a lot to juggle in post war America. Believing for peace… Last week my fourteen-year-old daughter nervously approached me and told me said had something important to tell me. Several scenarios quickly ran through my head, none of them comfortable conversation topics. But what she professed I had long been ready to combat, with a reply that was sincere in my heart and ironclad. She wanted me to know that she knew Santa wasn’t real, and I didn’t have to get her any gifts from Santa. I sensed her confession was less out of blossoming maturity, and more out from economic concerns—she wanted to save her mother a buck. I appreciated that. No way is this beautiful two-year-old going to grow up and stop believing in Santa. Unfazed, I held firm to my position. My response had nothing to do with me trying to cling to my baby’s innocence and everything to do with a ridged personal stance. 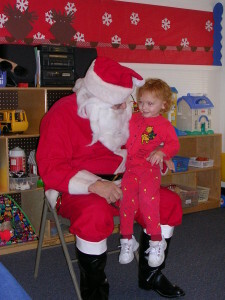 I didn’t hesitate to tell her I still believed in Santa, and my advice to her was to never stop believing. She probably internally rolled her eyes at me, but I hope I at least planted a seed in her strong willed mind. I really do believe in Santa Claus. For all that Santa has represented over the centuries, to me his strongest attribute is the sense of hope and calm he casts during what has become a frantic and stressful season. Santa grounds us in the foundation of Christmas, in charity and sacrifice, which is the pure definition of love. 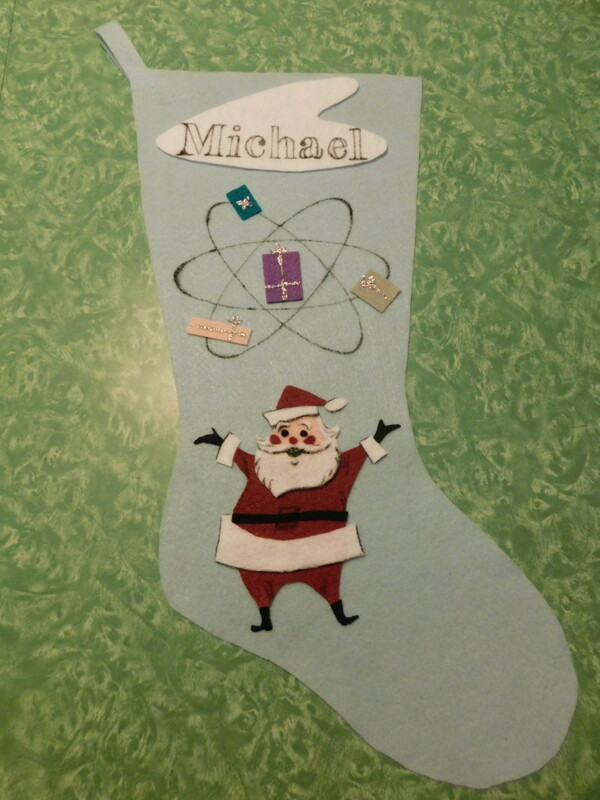 So Santa Claus, an undeniable mid-century icon, became the foundation for my atomic stocking. Many of the images of him from the era, mostly on Christmas cards, depict him holding up a tall stack of wrapped packages. It’s as if during that time in history he was considered to being carrying a heavy load. As my mind struggled with exactly what Santa should be doing, and debated if holding up packages had any mid-century significance, those packages began to weightlessly swirl over his head, as if he were juggling them. Perhaps they simply defied gravity. Although I couldn’t find the perfect stocking on eBay, I did manage to score McCall’s stocking pattern #2271 from 1958, which I think lent authenticity to the cut of mine. Besides Santa and his inventory of presents, I also mixed into my design period appropriate motifs and a handful of mid-century colors, including pink, gray, and sky blue. If I can get the back of the stocking sewed on before Christmas Eve, Santa and I can continue our long standing contractual agreement. Promoting economic expansion through consumerism while incentivizing scientific responsibility in our world leaders is a big job, but leave it to Santa Claus to juggle it effortlessly. I don’t know how many times the little boy from Virginia pictured above had to “duck and cover” under his school desk, but I’m pretty sure he never hung a Christmas stocking with sensitive lines depicting the atomic symbol or which fashioned an inscription of his name. Somewhere in his youth, however, he perfected the talent of comedic timing, as he told me this joke as I was wrapping up this blog: Why should you never trust atoms? Because they make up everything. Apparently they do make up everything, even contemporary depictions of non-existent, mid-century, atomic Christmas stockings. “Atoms for Peace”. Wikipedia. N.p.,n.d. Web. 22 Dec 2016. Moxie, M. “Atomic Age Design: Beauty and the Bomb”. Retropedia: A Look at Style and Design Through Time. 23 Jan 2013. Web. December 2016. Philpott, Sarah. “St Nicholas: Naughty or Nice?”. The History Vault. N.p.,n.d. Web. 22 Dec 2016. Hine, Thomas. Populuxe. Alfred A. Knopf, Publisher. 1986. This story starts at the end of another, in a 1950’s, high-style modern movie. 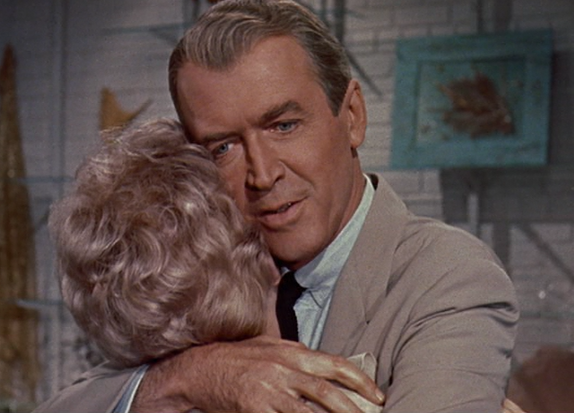 After months apart, Kim Novak and Jimmy Stewart ponder the disputed origins of their broken romance. Upon the realization that the experience changed Miss Novak—she lost her supernatural powers—the couple fall into a passionate embrace. Once again, Mr. Stewart’s blue eyes dance with excitement, their exaggerated brightness thanks in part to Technicolor voodoo. After his thoroughly enjoyable performance in this 1958 film, Bell, Book and Candle, I decided it was only polite to give him a considerate, period appropriate answer to that last, lingering question about magic. So I turned the question over to a gentleman who was at the top of his game that year, an icon and entertainer who professes to completely understand feminine sorcery. I gave it to a crooner whose blue eyes required no Technicolor enhancement, Mr. Frank Sinatra. Sinatra’s response to the question comes in the form of a song, which was recorded a year prior to our movie, in 1957. His song, appropriately titled “Witchcraft”, clearly lays out the defining elements of that seductive, womanly magic. Frank lists several features, and I pulled out six that seem to be reasonably easy to identify. A lot of fun gets poked at Glinda. There is a belief that she tells Dorothy near the end of the film that, all along, she had the power to return home. By merely clicking her heels together and thinking, “there’s no place like home,” Dorothy could escape the lush beauty and excitement of Munchkinland and Oz, and return to her dreary dirt farm in Kansas. As a former Kansas farm girl, I’m telling you, I’d think twice about that return trip. 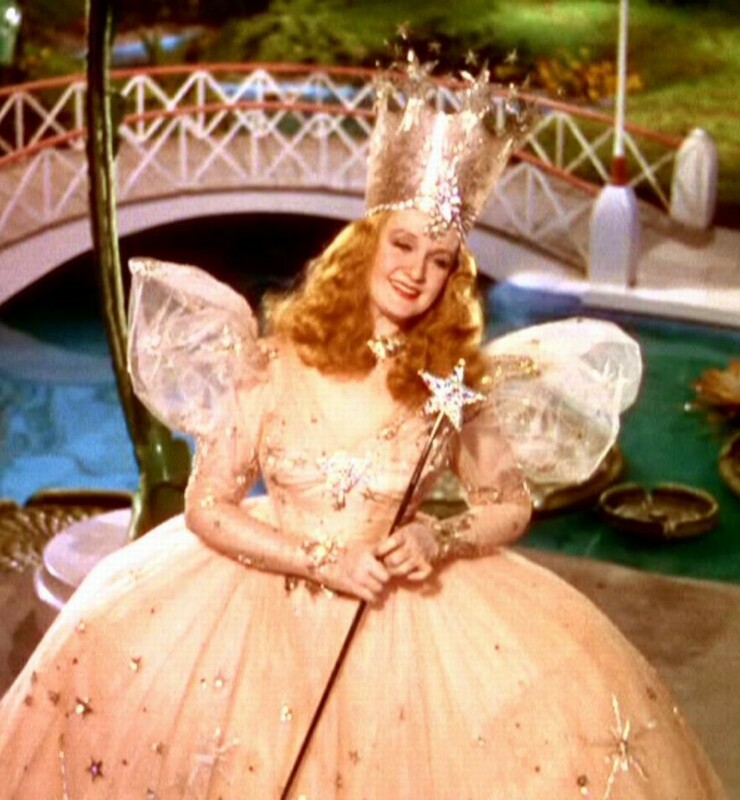 Glinda has been ridiculed for keeping this knowledge from Dorothy, and many bloggers and vloggers even go so far as to suggest Glinda is actually a bad witch, by not being truthful with Dorothy and by exposing her to unnecessary harm. But listen closely to Glinda’s words in her final scene. She tells Dorothy that she only had the power to return home after she discovered why her heart wanted to go there. Dorothy undertook the yellow brick road journey—a difficult and challenging one—in order to appreciate what she had been separated from. 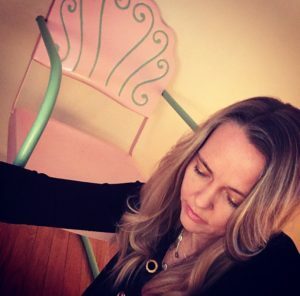 Glinda put her on that path instead of waving her wand and sending her home, and that act of charity over the simplicity of magic makes Glinda a beautiful witch, inside and out. That same beauty renders the Wicked Witch of the West defenseless against Glinda. 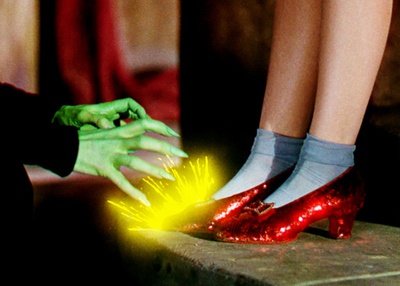 To help Dorothy, Glinda magically transfers the ruby red slippers from the feet of the dead Wicked Witch of the East to Dorothy. The Wicked Witch of the West has no moral issues about using her power to get whatever she wants (the slippers), yet she’s reduced to threatening Dorothy and her innocent dog, instead of using witchcraft to remove them and be on her way. Glinda’s true power springs from her sense of charity. Whether its source is witchcraft or a passion for goodness, Sinatra would be defenseless to condemn her for the gift she gives Dorothy: an understanding of the magic within her own heart. Steamy with a touch of mink. The old adage—where there’s smoke there’s fire—fits this witch to a T. She’s introduced as a whisper of smoke, after having been burned at the stake in 1690s Massachusetts. Jennifer and her father Daniel are denounced as witches and caught up in the Salem witch trials hysteria. In 1941, another form of intense heat, a lightning bolt, zaps the Oak tree that has been restraining Jennifer and her father outside of Salem for over two hundred years. A large branch breaks and releases their spirits, which again take the form of smoke. But it takes a fire in the Pilgrim Hotel, started by her warlock father, to transform Jennifer’s smokin’ body to one that’s intensely hot. 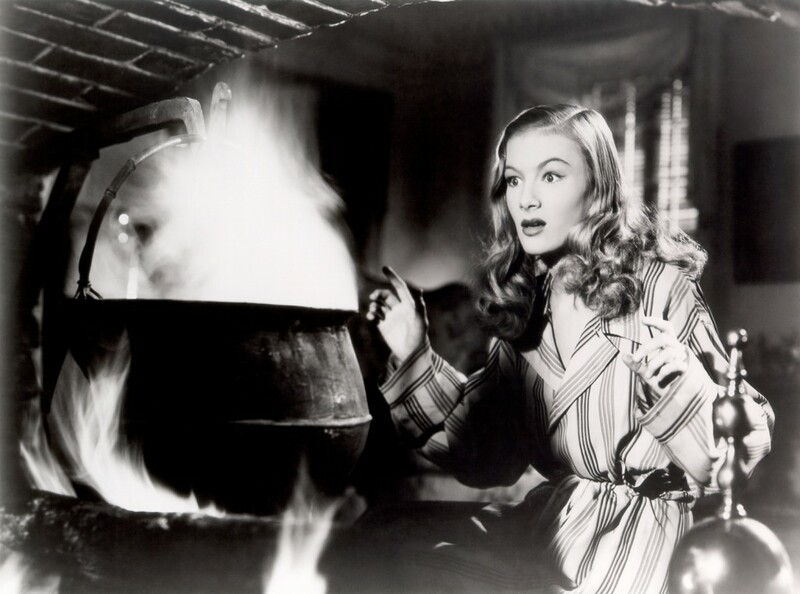 By intensely hot, I’m referring to that of the sizzling Veronica Lake, the actress portraying Jennifer. The story repeatedly presents us with blazes in fireplaces, sometimes so Jennifer can talk to her father (he needs fire to turn into a body) or so she can create a magical love potion. Not surprising, the steamy love potion she concocts is drank by the wrong person, with the sparks of love cast in reverse of their intentions. There’s no doubt in Sinatra’s mind that Jennifer is a thoroughly modern witch. Her sophistication and charm burn up the silver screen. 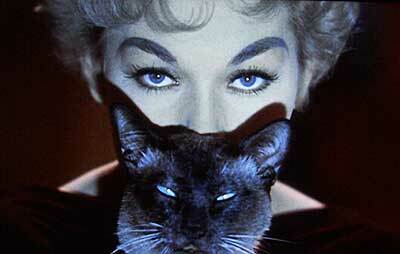 Kim Novak’s eyes are mystic—a light shade of green that renders observers spellbound. How fitting for her to play Gillian Holroyd, a mid-century New York witch who may or may not have cast a love spell using an iconic, seductive stare. The image of Gillian with her face partially shielded by her familiar—a cat named Pyewacket—has evolved as a representation of the entire film. Gillian’s soft green eyes above Pyewacket’s bright blue eyes creates a mesmerizing sight, an echo of sorcery fused with an inescapable tune. Gillian hums a seductive variation of the theme song while the cat purrs, both sets of eyes solidly fixed on an unsuspecting gentleman, Shep Henderson. Then, through either magic or Technicolor trickery, Gillian’s eyes begin to mirror the cat’s and turn to a bright blue. The results of her long, intense stare? 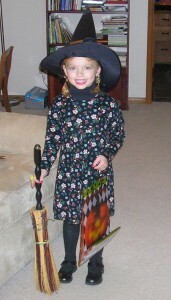 Did she cast a spell? It’s never really clear, buts Gillian’s artful attempt has kept me entranced with this film, many times over. Shep: Have you been engaging in un-American activities? Gillian: I would say very American…Early American. She means it. You can tell by the warmth of her ever gleaming smile. Samantha Stephens is lovely yet practical, the picture perfect housewife, ever friendly neighbor, charming and affectionate wife, dotting mother… Oh, did I mention she’s a witch? Nothing about her really says, “witch”, except of course, the way she twitches her nose and situations magically change. But everything about her says, “nice.” In the pilot episode, Samantha promises to give up witchcraft—a birthright that makes everyday life easier—for the happiness of her new husband, Darrin. Arguably, her self sacrifice is the true definition of love. Upon returning from their honeymoon, Darrin’s overly affectionate ex-girlfriend, Sheila, invites the newlyweds over to her lavish home for a get-together. Sheila’s cover story is that she wants Samantha to meet the “the gang.” Apparently it’s not obvious to Darrin, but we recognize her jealousy and vengeance brewing when she extends the invitation. There’s no nicer witch than Samantha Stephens. Sinatra knows it, and so do we. She didn’t use witchcraft to win Darrin’s heart, a trick our previous two witches attempted to employ. With genuine affection, Samantha rounds out the mid-century era of witches with beauty, kindness, and the purest romance. 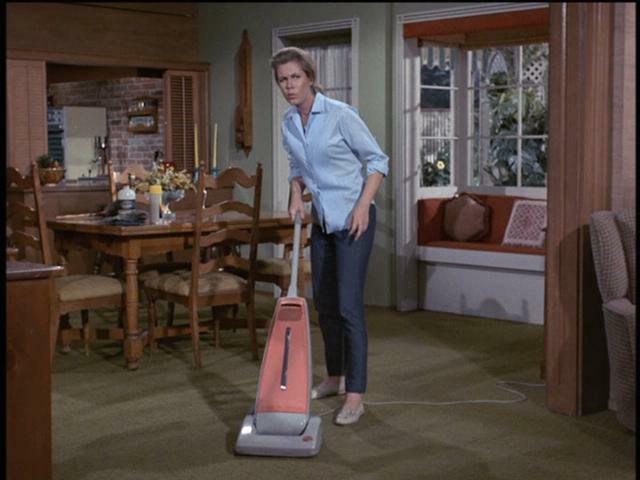 Would an old-fashioned witch vacuum? Heck no. Sam is as modern as they come. The mid-century modern witch, at least as portrayed on film, casts off the centuries old, stereotypical, haggard appearance for a clean, sleek, polished elegance. No surprise, as that look defines mid-century modern style. And her heart, at least how it’s represented at the post climax point when we say goodbye to her on film, is lovely. It’s light and refreshing, like the gin and tonic Sinatra holds in his hand. It’s soft and warm, draped across Frank’s back, like the delicate arms of his favorite, sultry, mid-century witch. 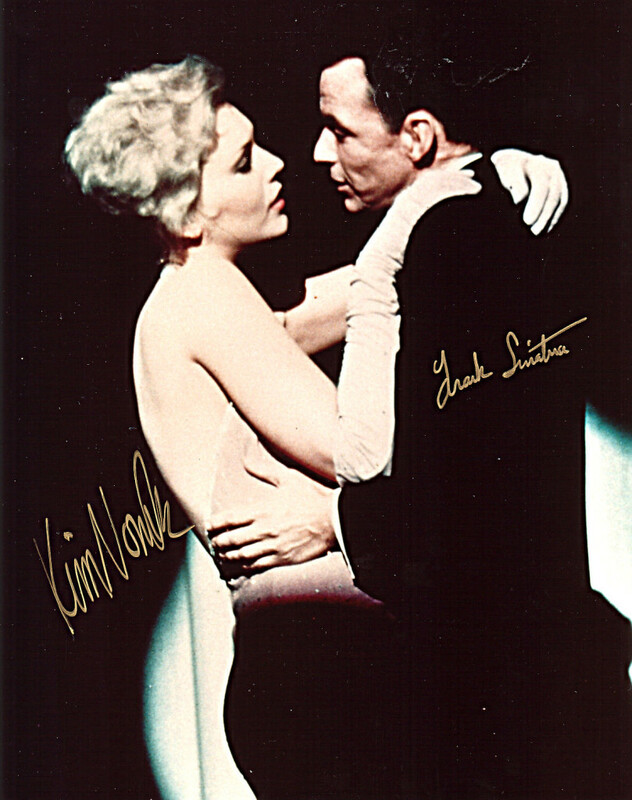 Frank with Kim Novak. Man, that witch can stare! Long, slender legs. Blonde. It was love at first sight. I eyed those lean legs sticking up out of the ginormous dumpster, and what could I do? I had to go in after her. So I scaled the side of the rusty, seven-foot tall dumpster, and, with my tip toes balancing on a thin metal brace, I reached in, grabbed a leg, and pulled Judy out. Much to my disappointment, the rest of Judy was not so…appealing. But I’m no snob. I tossed Judy into my backseat and drove home, satisfied I’d saved another mid-century modern side table from a grisly death. Judy sat in my screened-in porch for many months. She had no table top (it was possibly left shattered in the bottom of the dumpster), so I placed part of an old, exterior split door on her, sort of as a temporary, make-shift top. For a while I sat drinks or garden tools on her, trying to determine how to fix her up. 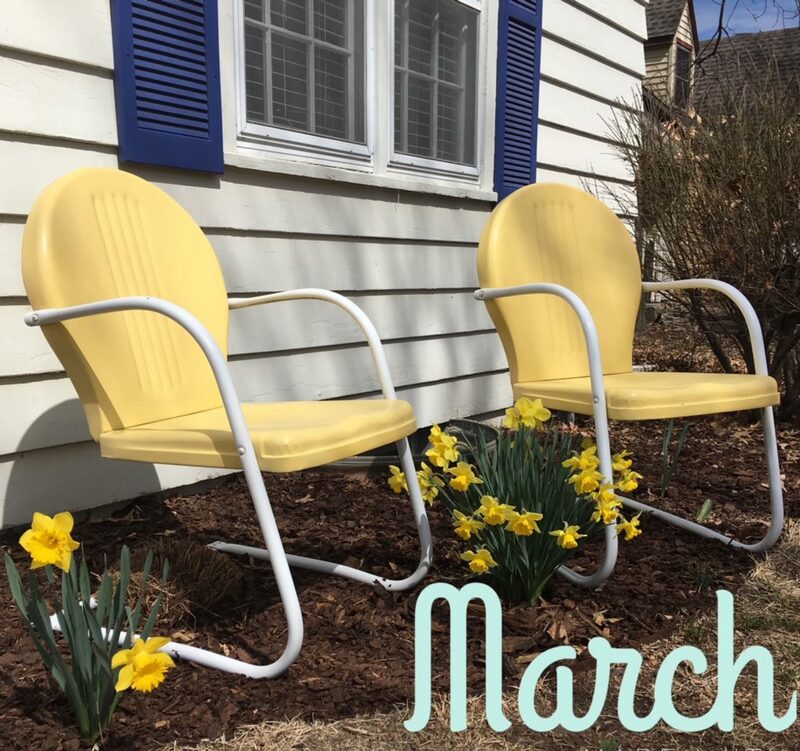 I liked the idea of keeping her on the porch—she was a good size for that space, and I figured her style was well suited as a companion to my metal lawn chairs. Her “body” was particle board with a plastic coated, fake, wood grained veneer, so I was confident the extremities wouldn’t harm it. But those legs…thin, golden, solid wood—maple or birch I guessed—I knew moisture and extreme temperatures would eventually take their toll on her four limbs and very modern brass ferrules. So as I accumulated more metal lawn chairs and fret over how to store them, my fears for Judy’s legs gave in, and I relegated her to the garage. I felt terrible. In late June I was rearranging furniture in my living room, and a spot opened up next to a mid-century sofa which is—I swear—only a temporary part of my collection. But the sofa wasn’t so useful without an end table. While relaxing on the 1950’s sofa, guests need somewhere to sit their martinis, right? So I mentally searched all the tables in the house, until I remembered poor Judy in the garage. Unfortunately, she was a wreck. It was a Saturday morning and the kids were on a canoeing/camping trip, so I afforded myself some “crazy Mom time” to re-analyze my treasure. I pulled Judy out of the garage and wiped the dust off. Unfortunately, a long strip of her veneer had pulled away and needed re-glued and clamped for twenty-four hours. While being forced to halt my creative energies, I took that time to considered how to redefine her body, and cleaned-up and applied a golden stain to her worn legs. It took nicely. Poor Judy. Weathered legs, peeling veneer, no top. She had such awesome modern styling with deteriorating and ugly surfaces. But I had no doubts! The next afternoon I pessimistically released the clamp from Judy’s side, relieved to discover the glue held. 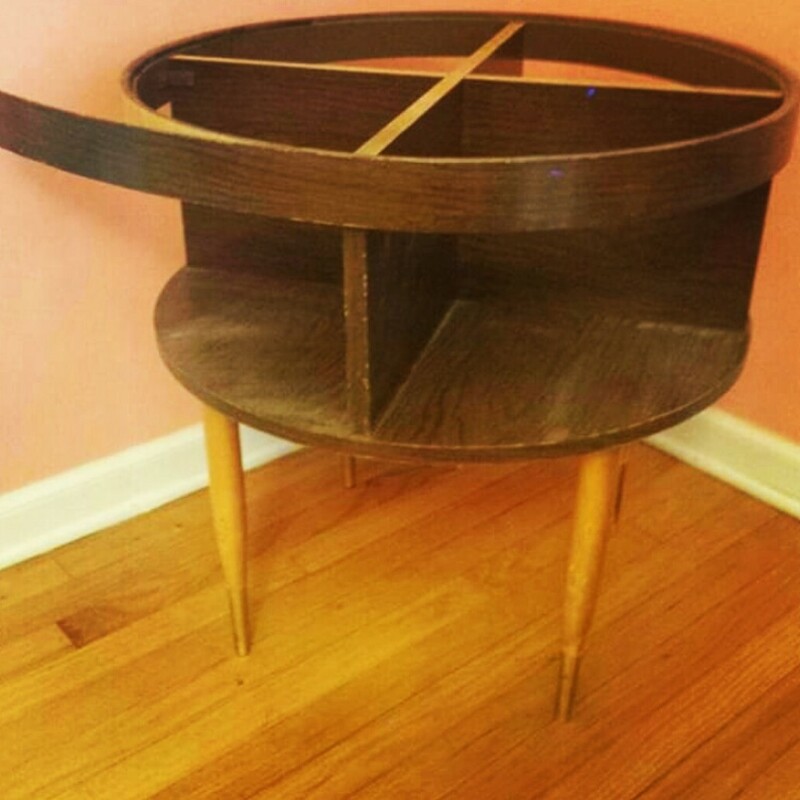 Her cute mid-section was so unique, with four rounded, triangular cubbies underneath the missing table top. But the plastic coated, dark wood grained, laminated veneer was unattractive and clashed with her golden legs. 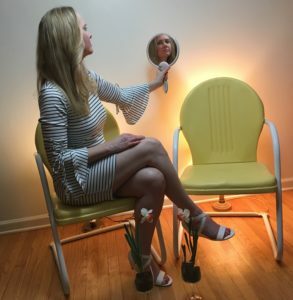 The styling was fun, practical—very mid-century modern, but it was so ugly I’d couldn’t imagine sitting anything pretty or interesting on it. The only solution…paint. I was kind of experimenting with a taupe and cream look on the living room walls, and since the table would sit against the taupe color, I thought I’d try cream paint. Also, the cream is light, fresh, and clean—a neutral that would not overpower the golden blonde legs but compliment their warmth. In the first moments of applying the paint I knew Judy was going to be more beautiful than ever. Immediately I knew the cream paint would take Judy out-of-this world! However, while I was painting, the artist in me realized that this piece needed some pop—a little “Punch” for my Judy. So I considered color accents, such as painting the surface quadrants an alternating turquoise and coral. 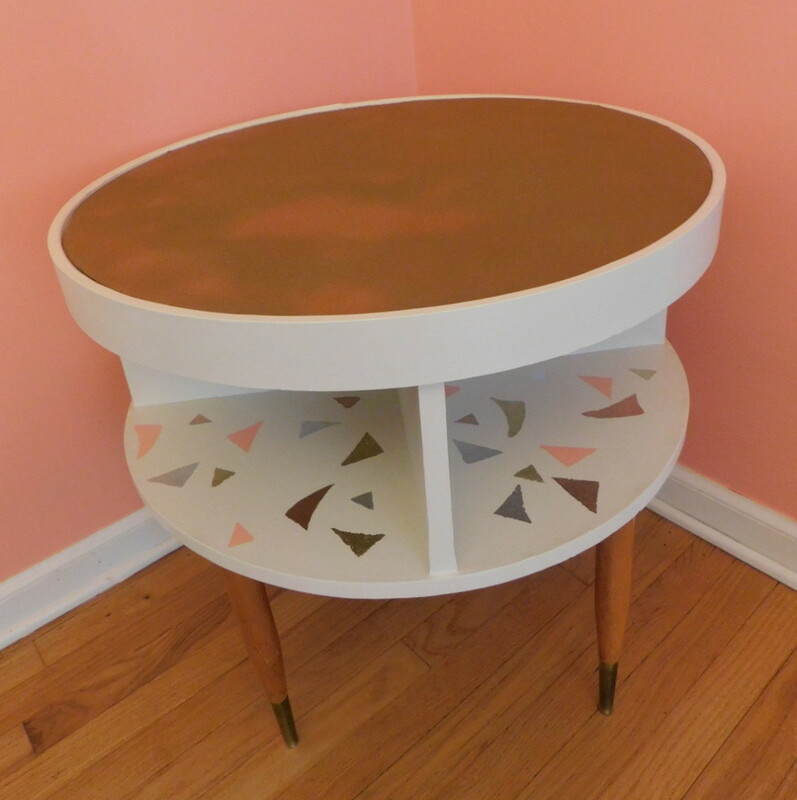 Although those colors are quintessential to the atomic era in which this table originated, when I imagined this paint scheme the results leaned to a piece of furniture better suited to a baby nursery, not a living room. But the idea of coral lingered in my head. And to be honest, while I cleaned her up I imagined my silver aluminum Christmas tree perch on top of her. Also, given that her golden brass ferrules cleaned up so well, my mind started to play with metallics and the coral, somehow mixed about. About a week before I started this project, a friend commented on a skirt I was wearing. I took a close look at the details of its tiny print and realized they were little triangles turned in all directions. My mind immediately flashed to a mid-century image, and I replied, “It’s my George Jetson skirt.” I was referring to the introductory scene of The Jetson’s when the earth explodes into a jazzy, abstract, array of dancing, multicolored triangles. This brief sliver of animated television history is classic, mid-century, abstract art juxtaposed with classic, mid-century, swinging jazz. Think Paul Rand meets Frank Sinatra. Donna Mibus meets Michael Bublé. Neil Fujita meets Dave Brubeck…oh, wait, that one’s been done. Anyway, this all too short moment of TV nostalgia is a consummate spark of mid-century modern pizzazz. And it’s forever burned on my brain. 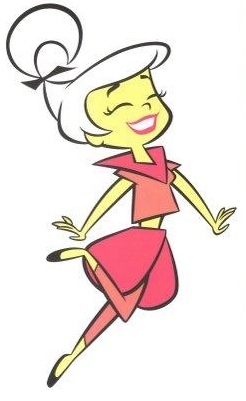 The same week that I discovered my skirt mimicked the Jetson’s animation, a friend of mine posted a sweet image of Judy Jetson on Instagram. 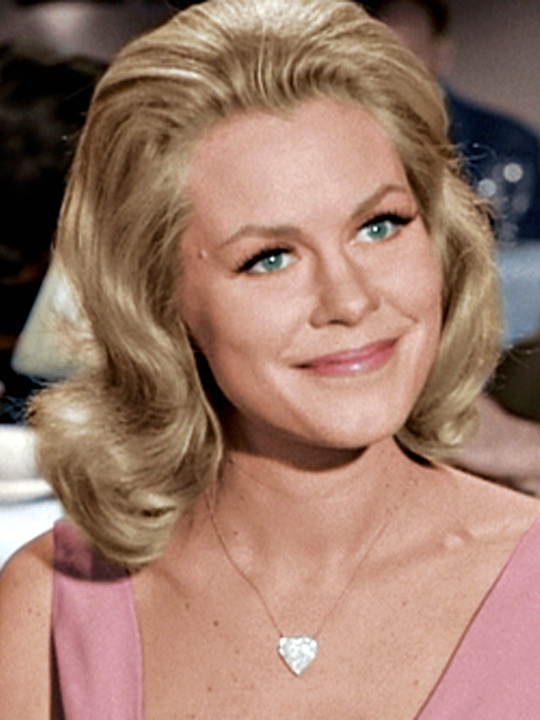 Sadly, it was a thoughtful tribute regarding the death of the woman who voiced Judy Jetson, Janet Waldo. These two references continued to dance about in the back of my mind for quite some time. 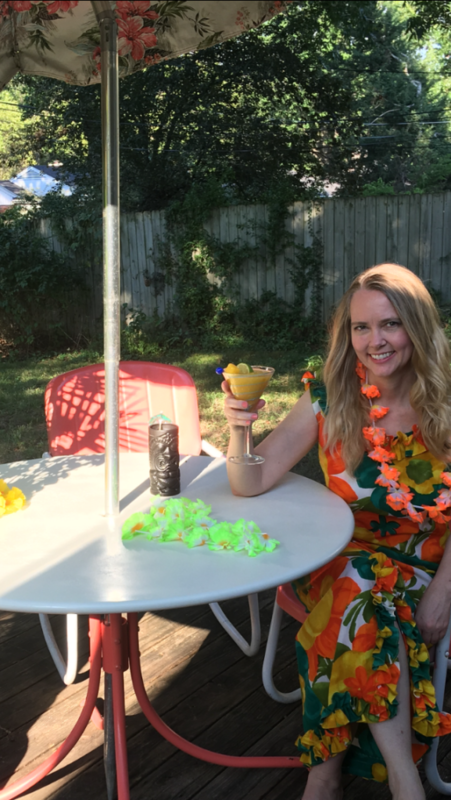 When I seriously focused in on how to incorporated a coral color into my table, the entire Jetson’s party sprang to the forefront of my thoughts, and there was Judy, decked out in the cutest coral and pink, 1960’s, futuristic getup. Suddenly, everything aligned and was right in my world. This was the point when my blonde, leggy table secured her name—Judy. Fresh, fun, flirty, and decked-out in pink and coral, Judy Jetson was a mid-century delight. 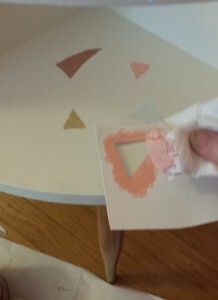 So I examined the triangular Jetson’s image on YouTube, stuck with the metallic color contrasts idea, made four triangular stencils, and sponged on the paint. It was a bit of quick and dirty fun. 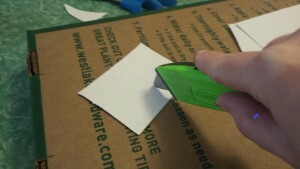 Cutting stencils from thin cardboard. Last problem: Judy still had no top…as in, no table top. Just for fun, I cut a piece of heavy cardboard to fit perfectly inside the rounded top part of the body, because there was a lip there and it just made sense. 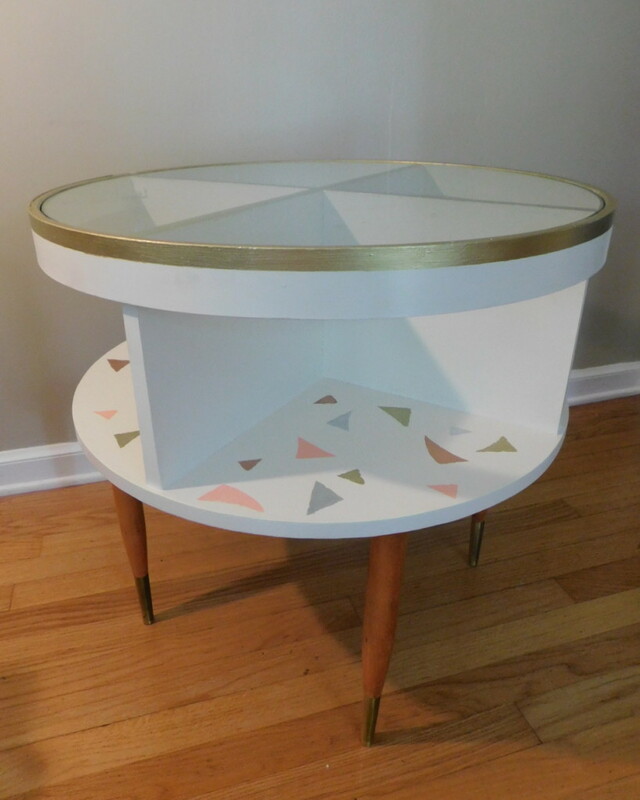 I spray painted this new make-shift top gold, thinking it would make for a nice contrast, giving three gold layers to the piece: the ferrules, the triangles on the nook surfaces, and the top. With a mock gold painted top. Interesting, but it blocks the downward view of the triangles. It looked okay, but this solution for a top cast shadows down on Judy’s triangles. Only one thing made sense at this point: glass. I painted the edges of the cross braces gold and a thin strip around the top ring gold to maintain the three layered consistency, and had a piece of glass cut to fit inside the lip. At $40, this was my only real monetary investment in the piece. Presenting Judy…complete with glass top. One last thought…Did you notice how my table resembles the buildings in the Jetson’s intro video above? Large, round, layered structures held up by long, thin posts (legs)? Kind of seals the deal, doesn’t it. I love it when everything falls together. Just like how my mid-century aluminum Christmas looks smashin’ on my mid-century end table which was inspired by a mid-century cartoon character. As I suspected and hoped. Judy is a lovely stand for the aluminum Christmas tree. Who is A Vintage Chick? 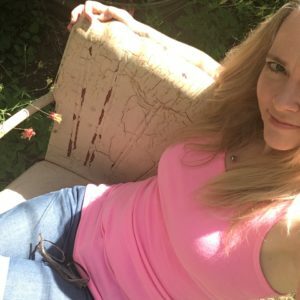 I'm a blogger and fiction writer passionate about mid-century living. Find out more on my About Me page.